Once you enter the cabin of the new Honda City, it is difficult to spot the updates as the layout and overall design have been left unchanged. Instead, Honda has tried to make it more upmarket with the use of soft-touch leather on the dashboard. The piano black-finished central console too has got a design revision. In the previous model, the smaller 5-inch infotainment screen and the oddly positioned knobs made the entire arrangement look clustered. In the new City, however, Honda is offering a 6.9-inch touchscreen infotainment system. Additionally, it gets an all-new interface that is more responsive and easier to use than the previous unit. Browsing through the different options has got a lot better. Honda has also added MirrorLink to help it connect with smartphones. Although we believe, in the present times, Android Auto and Apple CarPlay would have been more useful as modern cars are adopting to the new tech. 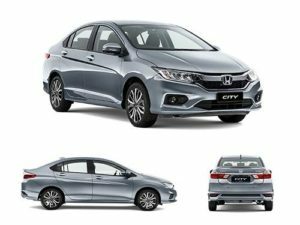 The infotainment system also gets an on-board memory of a 1.5GB, another first in the segment.Considering the fact that the 2017 Honda City retains the overall dimensions of the previous model, the cabin space remains unchanged. While the changes aren’t much, the modern infotainment system, soft-touch leather and the electric sunroof have made the City feel more feature-rich than before. The City continues to be powered by the same set of petrol and diesel engines. The 1.5 litre i-DTEC engine that makes 100hp and 200Nm delivers great low-end performance and is smooth and linear in a very un-diesel-like way, but rev it hard and it becomes rather noisy. Honda claims to have added more insulation for lowering the NVH levels in the diesel, and, though it is a marked improvement, there’s only so much that could be done to curb what is inherently a noisy engine. Ambient sounds have gone down a bit, but the diesel engine rattle is still an issue. The petrol option is of course the tried and tested naturally-aspirated 1.5 i-VTEC engine developing 119hp and 145Nm. The motor is still a riot for enthusiasts, revving out eagerly to its red line and making a lot of its power at the top end. It’s quite usable at the bottom end too and, as the revs climb, it can get a bit vocal. Gearbox options remain the same as well with a six-speed manual for the diesel and a choice between five-speed manual or seven-step CVT automatic for the petrol. With India’s crowded roads and newfound fondness for automatics, it’s sad that the City doesn’t offer such an option on the diesel, but that’s just something that will perhaps have to wait for the next generation.